A happy bird is a bird with a lot of toys, that change often. 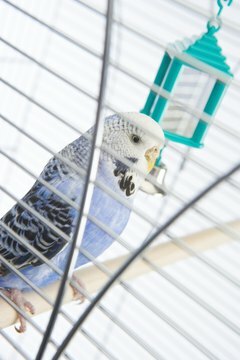 Pet birds, even small breeds like budgies, need to chew and destroy things. It makes them happy, and it cleans and conditions their beaks. Toys also help keep birds from getting bored when you're not around. Think safety first when it comes to materials. Nontoxic and natural materials are the only choices for bird toys. If you wouldn't put it in your mouth, then you probably shouldn't give it to your bird. Remember also that a bird's mouth is his only hand: materials should be size-appropriate. Budgies are small, so plastic beads and small pieces of wood are good choices. Vegetable-tanned leather, natural sisal rope, 12-gauge wire and craft sticks are also good choices for budgie toys. Budgies like ladders, which can be made from craft sticks, beads and wire. Make ladders that reach from the bottom of the cage to the top, or just go from one perch to another. Better yet, make both. Budgies also like toys that have “fingers” and knots that they can try to undo. Simply tie a bunch of leather strings into a tassel, and add beads and knots to the stings in random places. Your bird will spend hours trying to figure out how to get the beads off. You may have noticed that your budgie likes to play in your hair. That's because budgies, like most birds, are social groomers. Use sisal rope to help satisfy your bird's natural instinct to preen. Fold a 14-inch piece of sisal rope in half and tie a knot at the end with the loop. Untwist the two dangling pieces of rope so that they start to get fuzzy. Hang the rope in your bird's cage and let him do the rest. You can also make a grooming toy from felt fabric. Cut the fabric into strips about 6 inches long and half an inch thick. When you have enough fabric (about 20 strips should do it) tie them into a bundle at the top with another piece of fabric. Hang the bundle up against the side of your budgie's cage. Some budgies really like bells. You can either add bells to the bottom of existing toys or make bell-centric toys just for the fun of it. To make a bell toy, start with a piece of thin rope about 8 inches long. Tie a loop at one end of the rope so you can hang the toy later. Slide bell after bell onto the rope—you can separate them with beads if you want, but you don't have to. Knot off the end of the rope so that the bells can't slide off. Make sure you hang the rope so the bells will jingle freely. Budgies also like to swing. Swings can either be shaped like a sideways “D,” with a straight perch bottom and domed top, or like a “O,” with no perch. Make a “D” swing by drilling a hole in either end of a small natural wood perch, threading the hole with wire and covering the wire with beads. An “O” swing requires only a wire and some beads formed into an “O” shape and twisted together at the connection point. You might want to offer both types of swing, just to spice things up. What Cleans Off Parrot Poop?